Review of "Everyday Training: Backyard Dressage"
I found that no method can produce the best results unless the basic principles of dressage are used. The author recommends doing this work in a snaffle bit. In order for a horse to be properly trained, he must be taught to bend laterally — bend his spine full length from side to side. The broken snaffle is the most effective tool for this training because you have independent control of each side of the bit. Three of the book's sixteen chapters discuss longeing. This is not the free longeing so often practiced nowadays. This is the more classic way of longeing on a line that gets the horse used to contact and prepares the horse for work with reins and bit. Impulsion is one step farther than going forward willingly. 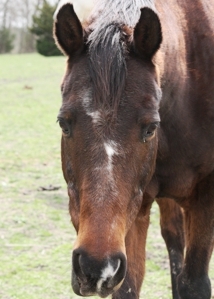 It is going forward with springy steps that push the horse lightly off the ground, making him a pleasure to ride. 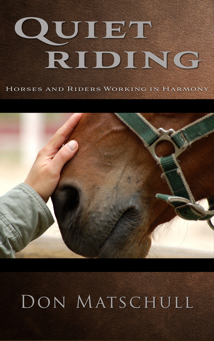 The author emphasizes that a rider must be relaxed and in balance to apply aids effectively. She cautions: Relaxation, however, does not mean limpness. Muscles must be engaged but not tense. Relaxation and balance lead to the next step which is feel. Feel of the horse means that without looking you can tell what foot is going forward, what lead he is on, what his head and mouth are doing, whether he is tense or relaxed, straight and balanced, etc.